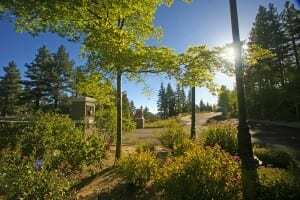 Tucked away in the foothills of the Sierra Nevada and sheltered by a lush forest setting, St. James’s Village stands alone as Reno and Northern Nevada’s most unique master planned community. 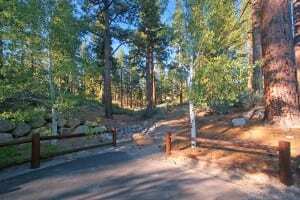 The bordering Toiyabe National Forest and Mount Rose Wilderness protects St. James’s Village from any outside development, further securing your investment. Privacy, serenity, and elegance… words that describe living at St. James’s Village. You know this from the moment the majestically designed gatehouse opens and reveals an extraordinary master planned community, accomplished in over 1,600 acres of pristine land. Nested among the Sierra Nevada’s towering pines and lush mountain meadows, you will find St. James’s Village, Reno’s most unique residential community. St. James’s Village is comprised of five distinctive neighborhoods: Bennington, The Woods, Edgewood, Ridge Crest and Timberlake Court. Each one perfect for those who not only have a passion for outdoor living, but appreciate the benefits of owning a home in a master planned community. Unfolding before you is the Woods, a neighborhood set deep within a forested setting; The Bennington Collection with a separate entrance leading to an open meadow; Edgewood, expanding across the chaparral; Ridge Crest, basking in a sunny forested setting; and Timberlake Court, with its dramatic entrance adjoining Joy Lake. The CC&Rs of our Homeowner’s Association not only serve to preserve the integrity of the development but are in place to protect your investment for a lifetime. The financial condition of the Association is sound with reserves adequate to cover all replacement items within St. James’s Village. St. James’s Village is a private gated community. All streets within the project are privately owned and maintained by the Homeowner’s Association. The Association employs a full time year-round maintenance crew to keep the common areas properly maintained, supplementing and enhancing the natural beauty of the development. Quick access is available to the new Interstate 580 Freeway, with the ramp just downhill from St. James’s Village. The Association owns snow removal equipment and retains expert knowledge to keep the streets clear and allow residents easy and safe access to the freeway. It’s precisely this combination of refined city life and rarified country elegance that creates such a high quality of living for the residents of St. James’s Village. With an international airport, a growing number of business parks, shopping malls, fine dining, the philharmonic, ballet, Triple A baseball and 24-hour entertainment, Reno offers the best of all worlds. You are invited to discover the ultimate expression of individuality and personal freedom waiting for you at St. James’s Village.